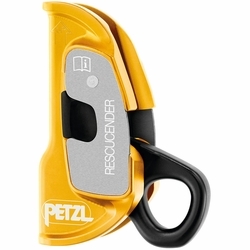 Petzl RESCUCENDER Rope Grab. Openable cam-loaded rope clamp. Simple to use and ergonomic, the RESCUCENDER is an openable cam-loaded rope clamp designed for use in haul systems as a tractor or progress capture device. Independent safety catches on each side of the device allow easy opening while reducing the risk of accidental opening. These safety catches are equipped with an unlocked indicator.